students and teachers (parents) in the study and review of a first course in high school geometry. found on the Directions page. There are 10 hidden internet boxes waiting to be found. Your ability to find each box will be determined by your skill at answering mathematical questions at the Geometry level. A certificate is available at the end of the journey indicating that you have successfully found all 10 boxes. Teachers: Have your students search for the boxes together as a class activity (especially during review), or assign the problems as extra credit or independent study. 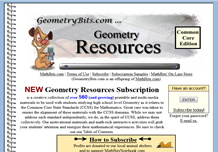 Answer Keys for Teachers: e-mail Roberts@MathBits.com from a school email address. How-to use your TI-83+/84+ to solve math problems. Info on TI graphing calculators and products. 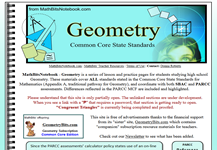 Worksheets, activities, labs, games (hardcopy & interactive) - for teachers. Free samples available. Answers available for teachers and parents by request only.